Does setting goals for your performance review process feel like a useless exercise—something you have to do every year but then quickly forget about until the end of the year? Too often the performance review process is a waste of time, money, and resources for everyone involved. We set goals that aren’t engaging or motivational and receive or give feedback that is neither timely nor helpful. It doesn’t have to be that way. Join expert Julie Margretta Wilson to discover how to transform "setting goals" from a form-filling exercise to a process that will accelerate your personal and professional growth. You'll also learn how to harness the power of timely feedback, both as a giver of feedback and as a recipient. You're a new manager who wants to learn how to manage and motivate your team and increase employee retention by setting goals that matter and giving feedback that is well received. You're an individual contributor looking to work with your manager to set meaningful goals that align with both the organization and your personal and professional growth. You also want to receive helpful feedback on your performance. With over fifteen years’ experience as a management trainer, consultant and coach, Julie has worked with a wide range of for profit and not-for-profit clients across the US and Europe. Clients include the IT Academy at Harvard University, Microsoft, Bullhorn, Greentown Labs, FrontPoint Security and Babson College. Her workplace skill building programs have helped thousands of employees and managers step into their potential as leaders and increase the creativity, collaboration and problem-solving capabilities of their teams. 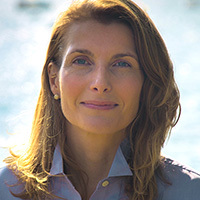 Julie graduated from Queen’s University, Belfast, with a degree in Business Administration and French and from the Harvard Graduate School of Education with a Masters degree in Education, specializing in adult development, learning technology and behavioral change. Discussion: What works when giving feedback? What doesn’t?